It was confirmed Thursday that the Sharks forward, Raffi Torres, will be out three to four months after undergoing surgery to repair his torn ACL. Replacing Raffi Torres will be no small task as the 31 year-old was slated to provide the bulk of the Sharks offensive grit. But with very little wiggle room in terms of salary, the Sharks may want to reconsider searching for talent out in the wild. The free agent market is thin. There are very few options that will give the Sharks a fraction of the production they will undoubtedly miss from their bruiser. Replacing Raffi Torres requires will require someone who has enough skill up front to score but enough sandpaper in their veins to make big hits. 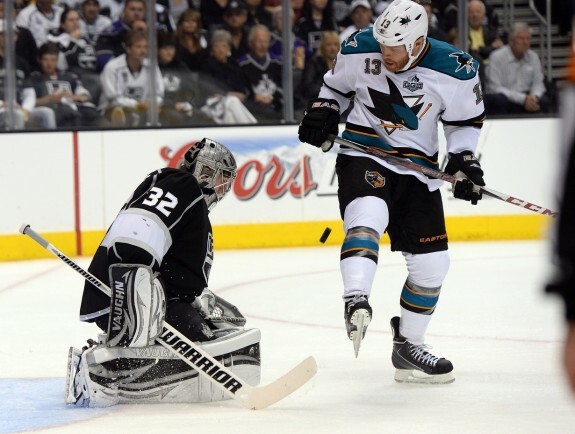 After losing Ryane Clowe last season, the Sharks struggled mightily. Enter Anthony Stewart. A first round draft pick for the Florida Panthers in 2003, he has never truly blossomed anywhere in the NHL. He has made stops in Florida, Atlanta (when it still existed), and Carolina. Last season he spent time with the Kings AHL affiliate and never made the first squad. Stewart was invited to Sharks camp to try and play his way onto the squad and with another injury, his chances may increase. That is the end of the choices outside of the San Jose organization. There is a problem, however. Anthony Stewart is simply just not good enough. He isn’t good enough defensively to play on a checking line or in a shutdown role and he doesn’t have the skill set to play on one of the top two lines either. All the Hurricanes could do was give him 6-10 minutes of soft ice-time per night and hope that he didn’t hurt the team. That is exactly how the Hurricanes used him for most of the year and Stewart may have scored nine goals, but a closer look at his numbers show that he probably wouldn’t be in the NHL on a good team. The Sharks do have options already in the franchise. Namely, Freddie Hamilton and Matt Nieto. One has been seen as the prospect right after Tomas Hertl to make the NHL squad. The other has impressed during the preseason so far and is making the final roster cuts very interesting. Matt Nieto: Does Speed Kill? Imagine, if you will, Joe Pavelski with the speed of Marty Havlat. Pavs is fast, but not quick to accelerate off a dead stop. Nieto is the option if the Sharks want to abandon all hopes of being a physical team above the blue lines. Replacing Raffi Torres with a speedster will completely change the face of the bottom two forward lines. While he is doing well with the squad this preseason, his lack of size does not deal with the Sharks current problem. The Sharks need size. For now, GM Doug Wilson said, plan is to give opportunity to players in #SJSharks organization to fill spot on roster. Hamilton, on the other hand, is a big and physical center. His game centers on disrupting opponents on the forecheck while helping out in his own end. While he struggles to produce much in the offensive end, his leadership qualities make him a positive influence. He is a skater that is not afraid to dig a puck out of the corner against the best in the league. In replacing Raffi Torres, this switch would be much more of a like-for-like scenario. While he doesn’t have the maturity and experience, his strength will help protect fellow skaters.